It’s tough to look at the endlessly expanding CG animated film realm and wonder just how different a landscape it would be today if its founding father happened to be anyone other than Pixar. Coming (exploding) onto the scene with a succession of blockbuster films and an uncanny knack for making all the right moves, truly it’s impossible to overstate their influence on the field. The trouble is, and as is so often the case, the competition has been steadily improving and while suggesting they’ve ever made a poor movie is certainly exaggerating, the sheer brilliance Pixar had once been known for has become a bit more hit or miss throughout the years. It comes as no surprise, then, that most of their effort in recent years hasn’t been to forge new ground so much as it’s been furthering the world’s collective time spent with the host of endearing characters they’ve introduced us to all those years ago; be they Mike and Sully, Woody and Buzz, Lightning McQueen and of course Nemo and Dory. 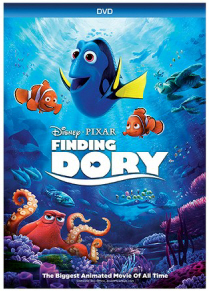 Released theatrically in the United States June 17th, 2016 (thirteen years after the original Finding Nemo), Finding Dory immediately proved that unlike the titular character, the world at large hadn’t forgotten. 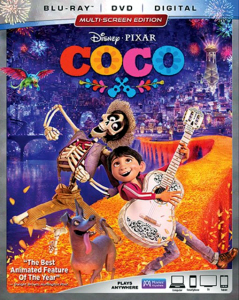 It rocketed its $200-mill budget to grossing over a staggering $1 billion worldwide, becoming the first Pixar film to cross the mark since 2010’s Toy Story 3 and broke numerous records along the way, including the highest-grossing animated film opening of all time in North America. The story here, much like the first one, can’t exactly be described as oceanic-deep but what it lacks in plot layers, it makes up for in well realized characters and impeccable delivery. Taking place a year after the events of Finding Nemo, Finding Dory once again builds upon the tried and true seek/ search formula. Only this time rather than a parent casing down the trail of his abducted child, we follow the child (Dory) in her effort to track down her parents. Their whereabouts and reason for separation isn’t nearly as plainly presented as Nemo’s but the piece wastes little time trying to hide its intentions. Rather, it gets underway fairly quickly and manages to fill its 98-minue run-time without relying upon cliche’ jokes or filler. The plot here is more about the characters we’ll meet along the way and while it begins by revisiting several of the gags from the first film (the manta ray teacher and his class, the burned out but good hearted surfing sea-turtles etc. ), this one finds its own rhythm within the first half hour and never looks back. Coming in, I really expected Pixar to have its proverbial hands full with trying to entice an audience of viewers who have been wowed to the gills (pardon the pun) visually throughout the years with what can be accomplished in the medium of CG but the veteran company sidestepped such concerns with ease. 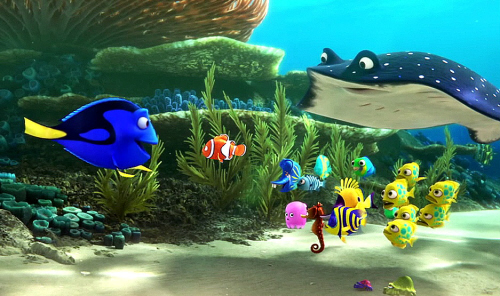 After all, when Finding Nemo came out back in 2003, the charm and capability of this new animated medium for storytelling were yet in their infancy. Each time Pixar took us to one of their worlds, it was the first time anyone had seen anything like it. 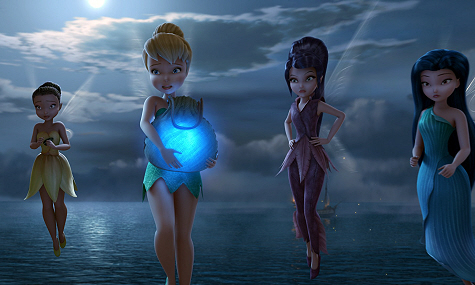 Not only has Finding Nemo already awed us with what a beautifully rendered CG ocean could be all about, dozens of other studios have followed suit in the decade-and-a-half since. 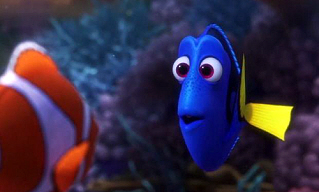 No, Finding Dory would have to stand or fall on merit of its storytelling and characterization alone. In this regard, Pixar not only proves it understands such realities, it rises to the challenge of reminding the world that story is what they do best. So that means the film is perfect, then? While undeniably solid, it isn’t without its peccadilloes. The pacing isn’t quite the razor-sharp package we’ve been getting from the likes of DreamWorks of late and tends to bog down a bit, especially with a multitude of Dory being reunited scenes. Additionally, some of the lessons presented are a bit heavy-handed; with humanity often posing the greatest danger to aquatic life, even over multitudes of natural predators and environments encountered along the way. In all, minor complaints and surely ones that will be more forgivable for the younger audiences Disney is targeting with the film. All in all Pixar proves to us yet again that it’s very unwise to doubt the company’s mastery over the genre they created. 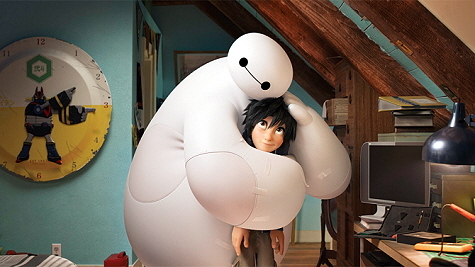 Fickle fans are often quick to write them off after releases like Brave or The Good Dinosaur, which attempt to forge a new tangent in an industry that is forever being splintered into sub-categories. 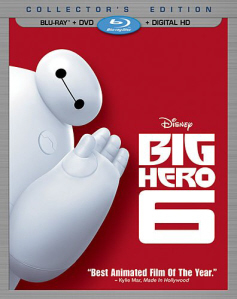 Then, just as quickly, Pixar revisits its roots and silences its skeptics with rich, character-driven story. That such praise can be heaped upon any studio upon reviewing its seventeenth feature film accordingly is a testament to staying power that can only be achieved by understanding their audience, adapting with the times and doing what they’ve always done best: Setting the stage for their characters so that the timelessness of human emotion can steal the show. Let’s get the obvious out of the way right from the get-go: With a track record as impeccable as Pixar’s it’s almost impossible not to hold them to a higher standard over the competition in the CG animated feature film game. After all, they did invent it. That said, it’s becoming increasing difficult to put a thumb on what or who Pixar is these days. 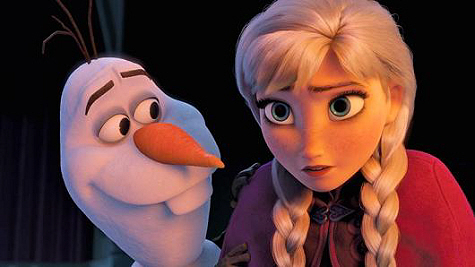 Since their absorption into Disney, the uniqueness that was once theirs and theirs alone is steadily fading. This isn’t to say they’re no longer the absolute upper echelon of the industry of course, rather the reality is slowly sinking in that walking out of the theater of their films in absolute bewilderment as to how they keep coming up with these things is coming to an end. The Good Dinosaur has also the misfortune of being released after Inside Out; a film which to many has shown the type of creativity and simplistic brilliance that put the company on the map in the first place. 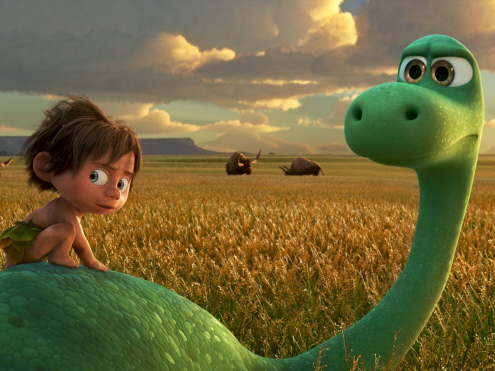 Comparatively, The Good Dinosaur isn’t nearly as progressive. However, had it found itself positioned between fairly lackluster sequels Monsters University and Finding Dory, perhaps critical reception would have been a bit more forgiving. The film has a bit of a turbulent history behind it as well. Apparently it was born, as most Pixar projects are, upon a simple/ clever foundation. Dating as far back as 2009, Up’s Bob Peterson hatched the concept that what if that asteroid that wiped out the dinosaurs and forever changed life on earth as we know it had missed? It’s rumored that by the end of summer 2013 Peterson was removed from the project, co-director Peter Sohn moved into the driver’s seat, the story re-imagined, a new cast brought in and a whole new projection for release calculated (in other words, pushed back). 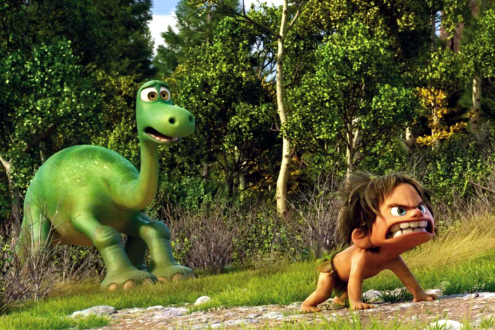 The end result is what we now know as The Good Dinosaur, Pixar’s 16th animated feature film, released November 2015. Interestingly, it also represents the first time Pixar has ever released two films in the same year (the other of course being Inside Out). The budget on this one is estimated at about $200-million and it took in $331.9-mil at the box office. 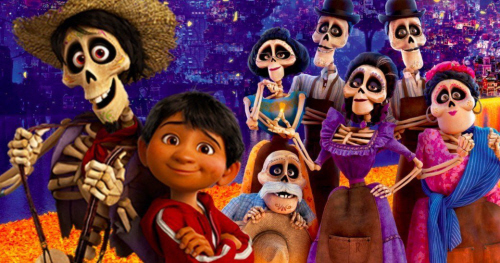 A monster profit for sure but a drop in the bucket when compared to the type of returns both Disney and Pixar have come to expect in their seemingly inescapable-hype marketing campaigned projects. In fact, it bears the distinction of being Pixar’s lowest grossing film to date. The story tells of Arlo, the youngest of a trio of apatosaurus hatchlings born (hatched) into life on the farm. Cowardly, awkward and gangly, Arlo struggles to find his place within the family farm as well as within the world at large. Due to a series of events, he finds himself far removed from the corner of the world his family calls home and ends up inadvertently befriending an orphaned human child named Spot along the way. 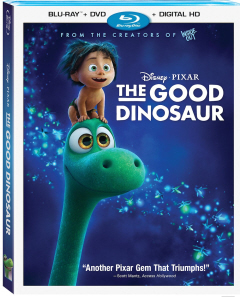 In a sort of role reversal from convention, the world Good Dinosaur gives us plays with the concept that not having gone extinct millions of years prior, dinos could have evolved into the dominant species on the planet; even during the rise of primitive man. As a result, they talk, work jobs, play pranks on one another and have to plan for the winter without access to food (an especially pertinent concern for the herbivorous apatasaurs). Though certainly food for thought, in execution the society is as much Flintstones as it is inverse Jurrasic Park. The core of the film builds upon the bond possible between man and beast- or in this case, beast and man. In a lot of ways it’s no different from what we witnessed in the vastly superior How to Train Your Dragon franchise from DreamWorks just told from the opposite perspective. About my biggest complaint with the piece is the depth- as in the complete lack there of. The above summary IS the story! Arlo gets separated from his family and begins the arduous journey back home and discovers himself along the way. Sure themes of believing in one’s self, physical size not being as important as heart, looks of enemies being deceiving etc. all make their presence felt along the way, the reality is this is hardly novel storytelling for any medium. The most heartfelt and natural moments of the film are the ones that work off the bond Arlo and Spot form (in an ironic twist where mankind is the animal to the civilized dinosaurs). In fact one particular scene where the main character and Spot explain the concept of family and what happened to each of theirs respectively without the ability to speak to one another harkens back to some of Pixars more brilliant and touching sensibilities. In the end, however, the lack of cleverness and straight forward nature of the plot are absolutely overshadowed by the possibilities of “what if”. Imagine what kind of a story you might tell if given the premise the dinosaurs were never rendered extinct, human beings are annoying little vermin in their world and you have Disney’s endless budget to make insure whatever you dream up can happen onscreen. Would you tell the basic story that an insecure farm boy gets separated from his home and learns about friendship through a bond with a savage human boy? Would that rival the type of cleverness that are the Toy Stories, the sense of irony that is Wall-E or the quiet dignity that defined a human lifespan found in Up? Worse still is this is the revised version of the story, keep in mind. If all of the delays were to improve upon the material, one really has to wonder what they had going on before. The greatest achievement the film can boast however comes in its visuals. They aren’t just good, they are downright spectacular. In high definition it is literally difficult to tell whether or not the backdrops and settings are photo-realistic (the character models, however, not so much). While this film may not be convincing evidence Pixar has continued to push the envelope story-wise consistently, it is indisputable proof that they never lost their stronghold concerning visuals. Like always, they set the bar and now the rest of the industry will have to play catch-up. In conclusion, make no mistake, The Good Dinosaur is an enjoyable 93-minutes, filled with memorable characters, big action sequences and visuals that absolutely dazzle. Kids will undoubtedly find the lack of complexity in plot and relatively small cast of characters easy to ingest. Where things get a little ugly is when you stop to remember that this is the product of the highest echelon the genre has to offer and then stop to ponder the legacy on which it was built. 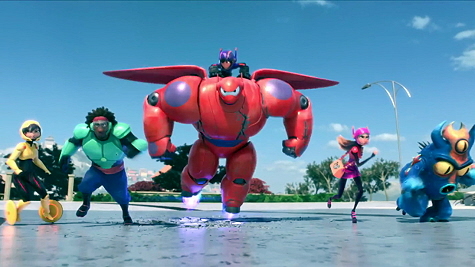 To my way of reasoning, 2008 represented a pretty interesting time in computer generated animation as Disney found itself in the tail-end of an identity crisis in effort to differentiate themselves from Pixar. A mere two years prior (Jan of 2006), the two companies merged but this came after several tumultuous years of failed negotiations, to the point where Pixar threatened to seek distribution elsewhere. 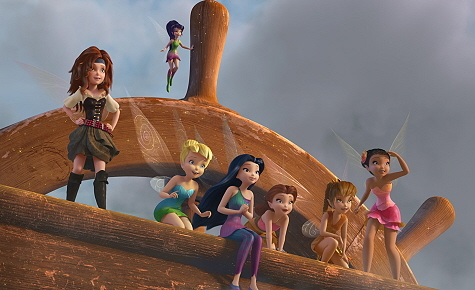 As a result of this period, Disney released several substandard CG films in part to show the general public that it was vested in the emerging media but also surely to prove to Pixar that they could make a go of it with or without them. Among these we got The Wild, Chicken Little, Valiant, Meet the Robinsons and Bolt. 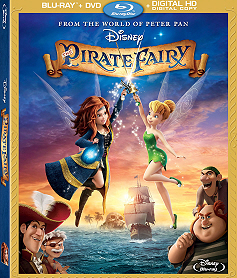 Yes its 2008 release places it well after the merger but the average development cycle for a CG feature film is 4 years. Not to mention it is well known that in 2006, after having become the Chief Creative Officer at Disney, John Lasseter (along with other directors from Pixar) viewed early cuts of Bolt and provided then-director Chris Sanders notes on how to improve the story. According to Lasseter, Sanders was actually replaced on the project because of his resistance to the changes that Lasseter and the other directors had suggested. 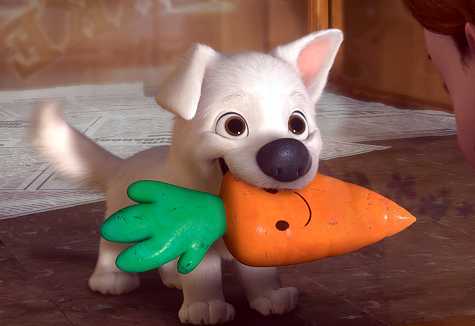 Anyway, looking back on Bolt now, it bears the unique distinction of feeling equal parts original Disney and Disney-Pixar collaborated. It introduced the non-photo-realistic rendering (NPR) style that would go on to define the look of Disney CG pieces like Tangled and Frozen; which in essence combines life-like animation cycles against backgrounds that almost look hand-painted. It’s also rife with charming animal emotion/ expressiveness but with a story just clever enough to suggest the Pixar school of influence. 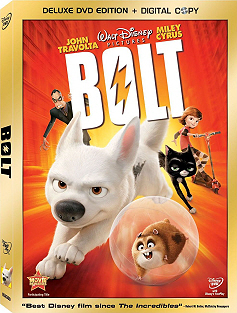 Bolt tells the story of a celebrity canine, left purposely in the dark to the concept that prime-time television is in fact fictitious for the sake of getting authentic emotion, who is dropped into the real world and forced to fend for himself not only unprepared but unaware of the simple reality that he is, in fact, just an ordinary dog. Of course by “the real world”, we mean the beautifully rendered digital real world where animals have the ability to talk to one an other but oblivious humans hear only barking, squeaking meowing etc. Celebrity dog Bolt, voiced by real-life celebrity John Travolta, encounters the rough and tumble realities that lurk beyond the walls of the studio set accompanied by a cynical abandoned cat (Susie Essman) named Mittens and overzealous hamster-in-a-ball named Rhino (Mark Walton). In the end he learns a thing or two about the true measure of a man, er I mean a dog and that the definition of a hero entails much more than simple props and special effects. Perhaps the piece’s greatest strength lies in the fact that its laced with satire that adult viewers will appreciate while the kids clamor to the clean visuals and adorable animals. In NY City Bolt encounters a trio of pigeons copied and pasted from Brooklyn’s mean streets, in LA he must contend with aspiring screenwriter birds with lame ideas and too much enthusiasm. As his journey across the continental US is based upon a children’s map from restaurant chain Waffle World, we are given a glimpse into the comings and goings of Waffle World patrons on a state-by-state basis. The pacing is brisk, with scenes never meandering around aimlessly or dialog extending past what’s necessary to get the point across. While I prefer this to the opposite type of exposition (one that feels longer than expected or a plot that develops casually), it does feel a tad concise as only can be delivered by countless corporate board meetings and story board sessions to make every onscreen dollar spent count a-la Disney or DreamWorks. 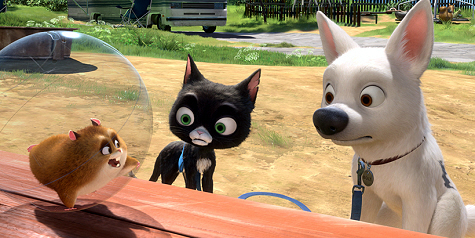 All in all Bolt is an enjoyable trip to take for viewers of all ages even now, some 7-years after its initial theatrical run. At the end of the day it strikes all the right chords yet somehow doesn’t quite capture the majesty or mastery of the craft as had been expected from contemporary Pixar; perhaps explaining why it had been nominated for the 2008 Academy Award for Best Animated Feature, which it would go on to lose to Pixar’s WALL-E. Apparently Disney realized a simple reality that still holds true today: They can’t lose by having Lasseter compete with himself. 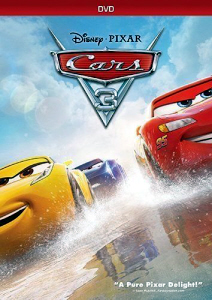 In the event that you wonder how in the world the Pixar Cars franchise morphed into the Disney Planes universe (of which this film is the first of a proposed trilogy), let’s take a look at interesting road that led to the piece’s development. After the merger of Disney and Pixar (a union affectionately termed Pixney); the lines between the two companies were forever blurred to the point where Pixar works (like Brave) bear the names of almost none of the individuals typically associated with Pixar while Disney pieces like the Tinker Bell films, Tangled, Frozen, and Planes boast Executive Production duties by none other than Pixar poster-boy John Lasseter. 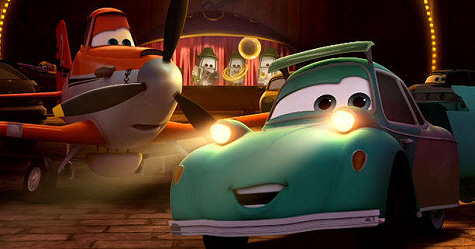 Planes actually takes the connection quite a bit further by crediting Lasseter as one of the writers, cameos John Ratzenberger (who appears in every one of Pixar’s productions) as Harland and follows Pixar’s impeccable attention to detail concerning such details as actual plane make/ model likeness, geography, historical accuracy and so on. Yet the fact remains the film isn’t considered a Pixar production and in fact comes to us from the typically direct-to-dvd branch of the Diz known as DisneyToon Studios (who’s last theatrical release takes us back to 2005 in the form of Pooh’s Heffalump Movie). 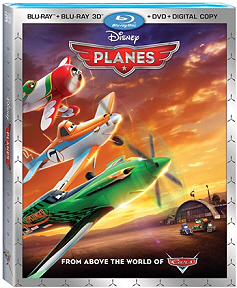 Planes too was supposed to be a direct-to-dvd affair with a fairly modest budget of $50-mil but thanks to a theatrical release gap left between Monsters University and Frozen, Planes got the nod to debut on the big screen on August 9, 2013. Confused? Don’t be- all of the behind-the-scenes antics in the world do not a good (or bad) movie make. Fortunately Planes has the advantage of sitting atop a very long line of animated film experience. While critics weren’t particularly enamored with the film, I can attest that it succeeds on a lot of levels where the much costlier ($200-mil) 2011 blockbuster Cars 2 fails. But before we get to all of that, perhaps a brief summary is in order. Planes follows the exploits of crop duster Dusty Crophopper (Dane Cook) who holds down steady employment at a Midwest cornfield while practicing aerobatic maneuvers in his spare time and dreaming of the fame and excitement of air racing. Keeping his dreams forever out of reach, his boss, Leadbottom (Cedric the Entertainer) and his forklift mechanic friend, Dottie (Teri Hatcher) keep reminding Dusty that he was built for the very specific purpose of dusting crops. However, his good hearted fuel truck friend, Chug (Brad Garrett); think a less redneck but equally innocent Mater, begins training him in private. The night before the qualifiers, Dusty asks an elderly and reclusive navy war plane named Skipper Riley (Stacy Keach) to teach him how to race. What follows is a global race adventure rife with personified planes from several nations; some friendly others not so much. Coming in at a runtime of 92-minutes and wearing a PG rating, Planes works on the tried and true “underdog out of his league” formula and delivers some pretty genuine laughs along the way. Sure it’s nothing we haven’t collectively seen before, but what Planes lacks in originality it makes up for with heart. 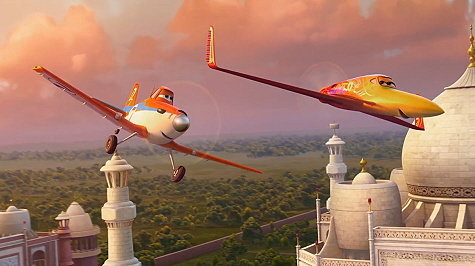 That and some really nice aerial scenes that (unlike say Cars 2’s action sequences), don’t take away from the subtle charm of the narrative in the process. If you really care about small details you may notice a whole plethora of little adult-enjoyable spices scattered about like Val Kilmer and Anthony Edwards as Naval fighter jets; essentially the Planes versions of their Top Gun characters complete with Iceman and Goose helmets to boot. In all Planes doesn’t succeed in spite of its simplicity and relatively modest budget but because of these things. In an industry becoming ever more inflated in terms of budget and eye-candy, Planes is a refreshing romp in a franchise that seemed to have lost its way a bit in its first dedicated sequel. Whether or not diving directly into a trilogy is a wise move is yet to be determined but considering the first Planes movie cost $50-mil to make and has already taken in $220-million, it’s a safe bet to say we’ll be visiting this anthropomorphic world of transportation for years to come. To animated film students and CG geeks in general, the geniuses responsible for the Pixar classics we know and love have become something of celebrities themselves. John Lasseter, Brad Bird, Pete Docter, Andrew Stanton, these are the cornerstones of the Pixar ideology so when you encounter a feature film boasting the Pixar name; it seems odd when such names are absent. Yet such is the case with Brave, Pixar’s 2012 big budget action film that spent 6-years in development at a cost of $185-mil. 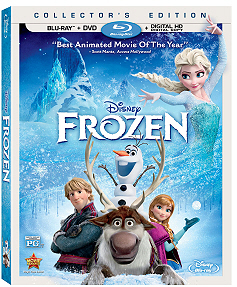 Though it wasn’t overly apparent at the time, looking back 2012’s Brave finds itself smack dab in the middle of a Disney animated heroine resonance (2010 saw Rapunzel take center stage in Tangled and 2013’s Frozen centers on Elsa, princess of Arendelle). 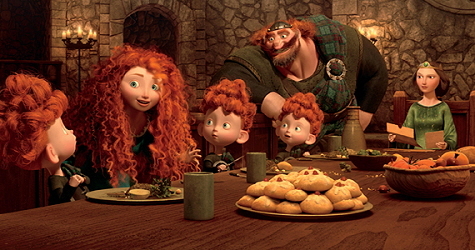 And, despite nearly a century’s worth of Disney experience with leading ladies (think all the 2D princesses throughout the years), Brave actually represents Pixar’s first attempt with the concept. How did they do you ask? The answer depends heavily upon who you ask. 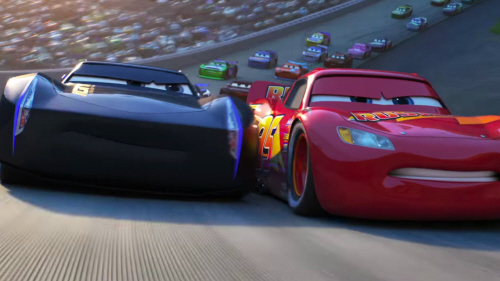 Critics weren’t overly generous with the film during its theatrical run, many going as far as to say that it continued in the lackluster tradition of the Pixar piece that preceded it: Cars 2. It doesn’t take much to realize that a lot of such criticism stems from the simple fact that Pixar has managed to raise the bar so ridiculously high in the 17-years’ worth of releases separating the first Toy Story from Brave. Were such criticisms justified with Brave? Not entirely but let’s first take a look at the plot summary. 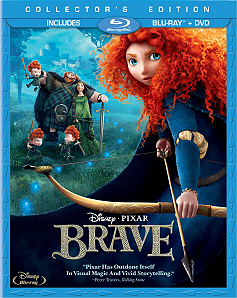 Set in 10th century Scotland, we follow along on the exploits of one princess Merida (Kelly Macdonald), a redhead tomboy whose regal lifestyle is forever jeopardized when she receives a bow as an early birthday gift. With aspirations of becoming the best archer in the kingdom replacing those of becoming the best possible wife in a parentally arranged (and politically-driven) marriage, Queen Elinor (Emma Thompson) is forced to watch helplessly as her rebellious daughter mounts her steed and flees into the wilds. Here the strangely underdeveloped will-o-the-wisps lead her to the cottage of a witch just itching to cast some spells. Of course if there’s one thing we can take away from all Disney films it’s that witches should definitely be one’s last resort when it comes to the concept of problem-solving and Brave isn’t about to break this tradition. In fact, rather than grant Merida’s wish with w a spell that could change her mother’s mind about the whole marriage situation, the spell in question actually changes the queen into a bear! Strange as this sounds, Merida’s lovable but brain-cell limited father King Fergus (Billy Connolly) just so happens to have lost his leg in bear attack in the prologue; and hence is not the world’s biggest fan of the creatures accordingly. The king (and much of the village) are bent on slaughtering the bear, unaware that it is in fact their wife and queen respectively. What results from this point forth is a lot of slapstick as bear Elinor knocks haphazardly about in structures and rooms too small for her newfound girth and does her best to communicate while remorseful Merida endeavors to reverse the spell. If this all sounds rather un-Pixar-like; that’s probably because it is. In action the film definitely feels more like something we’ve come to expect from DreamWorks; which is to say entertaining, humorous, solid, and pretty. 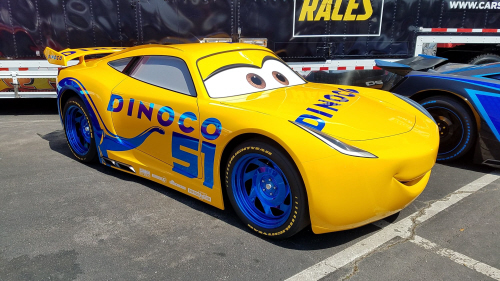 However, until now, Pixar has separated itself from the competition with unrivaled cleverness. It has been their concepts of observing and capturing the nuances of adult life and spinning them around a kid-friendly prose: In short, something for all ages. 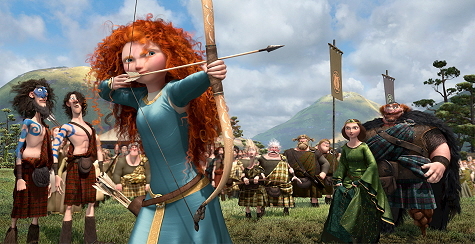 Brave however is a bit more forthright with its delivery and underlying message. The humor beats certainly harken back to How to Train your Dragon with the brawling, uncouth behavior of the Scottish clans-folk (particularly the overly proportioned King Fergus, who is eerily reminiscent of Dragons’ Stoic). The visuals, however, are simply stunning. Just when you think computer generated imagery has reached its peak, Pixar goes and develops a brand new hair simulator program that required 1,500 individual curl strands to be strung through with a flexible core not unlike the string of a beaded necklace, that allows the scarlet coils to bounce and brush against one another without unwinding. The misty and green Scottish landscapes are lush and unbelievably intricate with rendered textures and elemental effects that positively dazzle. Factor in a Patrick Doyle score and Julie Fowlis’ Gaelic soundtrack and the environment almost makes up for the lack of breadth in the back story. It is entirely too easy to get swept up in the grandeur of the environments at even a passing glance, surely a part of the film’s plan.